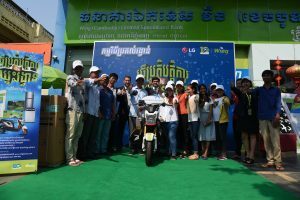 Phnom Penh (October 4th, 2018) – Wing (Cambodia) Limited Specialised Bank, Cambodia’s leading mobile banking service provider, is partnering with Royal Railway Cambodia to provide a highly-discounted train ride, plus a free krama to Wing cardholders, when paying for their train ticket via WingPay. This is the third consecutive year that Wing has provided a free gift for Cambodian nationals during major public holidays, in an effort to make their trips back home more convenient and much more affordable. This year, as a gesture of appreciation for all the support it has received over the past ten years, Wing is offering a special “one cent” price for its customers, who pay their train ticket to any destination in Cambodia via WingPay, at the Royal Railway Station in Phnom Penh between the 5th and 7th of October. They will also receive a beautiful krama when they board the train. For Cambodians, Pchum Ben is one of the biggest festivals of the year. During the 15 day festival, young and old alike visit pagodas and offer foods and candles to monks, in order to pay their respects to their deceased relatives of up to 7 generations. The krama is a staple of Khmer culture, being one of the most prominent Cambodian national symbols with a variety of uses. This humble garment, with its diverse patterns and contrasting colours, is part and parcel of Cambodian history. Wing cardholders can wear this special gift as they visit their local pagodas, or pass it on as a holiday gift to their hardworking parents. Wing Chief Executive Officer, Mr. Jojo Malolos, said that ever since Wing started operating in the Kingdom of Cambodia, the company has always strived to give back to society as much as it can. This year, along with the hugely discounted train transportation with Royal Railway Cambodia, Wing has chosen the krama as an additional token of appreciation for its loyal customers. “Wing wholeheartedly understands how important Pchum Ben is to the people of Cambodia, especially to those who have deceased family members and relatives. This is why we have partnered with Royal Railway Cambodia to provide vastly discounted train tickets as a gesture of goodwill and as an effort to help them get to their hometowns safely, while saving on their expenses this holiday season,” said Mr. Malolos. Meanwhile, Chief Executive Officer of Royal Railways Cambodia, Mr. John Guiry, said the company is more than happy to partner up with Wing (Cambodia) Limited Specialised Bank for this special offer as it is Royal Railway’s intention to provide Cambodian people with inexpensive and convenient transportation back to their hometown during Pchum Ben Days. Everyone is eligible for this promotion, provided that they make payment via WingPay. For those who want to take advantage of this special offer, you can download the app and top-up at any Wing representatives at the station prior to the promotion. This special Pchum Ben promotion also forms part of Wing’s 10th anniversary as the leading provider of mobile financial services in Cambodia. Wing (Cambodia) Limited Specialised Bank is Cambodia’s leading mobile banking service provider and one of the few specialised banks in the world. Established in 2008 and launched in 2009 Wing has transformed the way Cambodians send and receive money using a mobile phone. Wing is committed to providing financial inclusion via mobile banking services to the unbanked and under-banked, allowing every Cambodian to have access to local money transfers, bill payments and phone top-ups, as well as instant international money transactions in more than 50 countries. Wing’s success has been recognised by the prestigious Global Banking & Finance Awards, being named “Best Mobile Payment Solution Cambodia” in 2017. Wing remains at the forefront of the mobile money and electronic payment services market in Cambodia with 100% district coverage via a nationwide network of 5,000 Wing Cash Xpress outlets. It has partnerships with more than 6,000 merchants and global industry leaders including Mastercard and WorldRemit. Wing also provides funds and payment solutions to the corporate sector via its enterprise services. Small and medium enterprises, as well as larger companies, are able to use Wing’s payroll and disbursement services, helping to further develop its payment ecosystem. Royal Railway Cambodia is a subsidiary of the Royal Group, receiving a 30-year concession from the Royal Government of Cambodia for managing Cambodia’s rail network. Presently, the company is serving the main line from Phnom Penh to the western province of Preah Sihanoukville and to the north, connecting to Kampong Chhnang, Pursat, and Banteay Meanchey. Royal Railway provides regular passenger services to its customers ensuring all their needs are met. Some of its other services include coal trains, cement trains and fuel trains, which run up to four return services a day between Phnom Penh and the Port of Sihanoukville. In addition, the company also provides logistics services, warehousing, land and office space rental, general cargo, handling and storage, dry port operations, customs clearance, road pickup and delivery. Royal Railway’s mission is to provide value and efficiency for its customers by delivering a safe, cost-effective rail freight service that complements an integrated logistics network.